Under the crest of Shock Hill, the Woods at Breckenridge townhomes for sale face downtown and Baldy Mountain getting early morning sun before the white mountain’s shade is off the Blue River Valley below. Backing up against this hillside, a home in The Woods is secluded from any neighbors above, except the pines and fauna in nearby Cucumber Creek Wildlife Preserve. 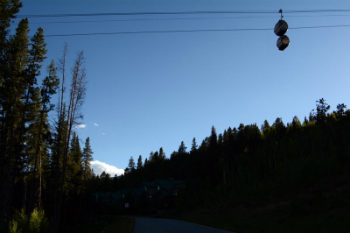 Yet, the Woods are short walk along Mountain Thunder Drive to the base of the Breckenridge gondola that takes skiers and foot passengers to the bases of Peak7 and Peak 8. The main grocer in town, City Market, is just a block to the north and downtown starts a block south. Discover the current Woods at Breckenridge townhouse listings below, or keep reading about the surrounding community. Build in the late nineteen-nineties in typical town-home style – built on a narrow footprint on several levels – they sit side by side in a long row, and are staggered to provide good sun to each home. These homes are large enough for a family, but sit on very small lots requiring little yard maintenance. Each has a large garage and basement, and all enjoy a nearby common greenspace. The Woods at Breckenridge borders an open space parcel in the town of Breckenridge’s extensive holdings, and from here you can hike along the Pense Miller trail and up onto Shock Hill, through the Breckenridge Nordic Ski Center or around Cucumber Creek; or ski downhill along the skyway, under Park Avenue to the terminus of the gondola. At the end of a day skiing at Peak 8, head downhill on Four O’clock run, veer off onto the skyway and you’ll soon find yourself at your doorstep. Size: 2264 sq. ft. to 3867 sq. ft. 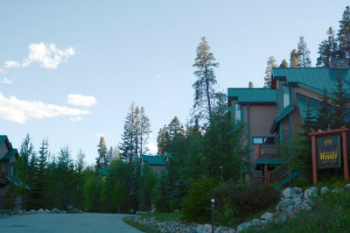 Amenities: on the ski trail from Peak 8, walking distance to the gondola terminus in town, walk to downtown, walk to City Market, in-town trails. From the traffic circle on the north side of Breckenridge exit onto Park Avenue and continue about .25 mile to Mountain Thunder Drive. Turn right and after the Mountain Thunder Lodge turn to the right on Woods Drive. Get the best local market forcasts from Breckenridge Associates. Send us an email or phone us at (970) 453-2200 to connect with an expert now.